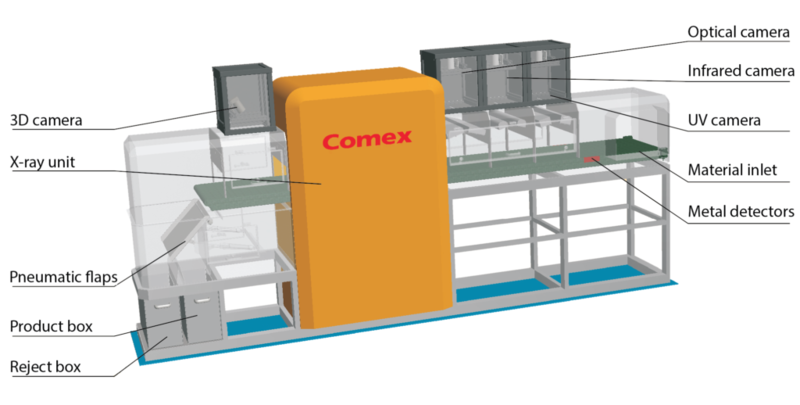 Multichannel scanning system from Comex (MSX series) provides a wide range of test possibilities to characterise and separate different materials. The main function is to characterise analysed particles in terms of their properties like colour, size, shape, texture, density, etc. 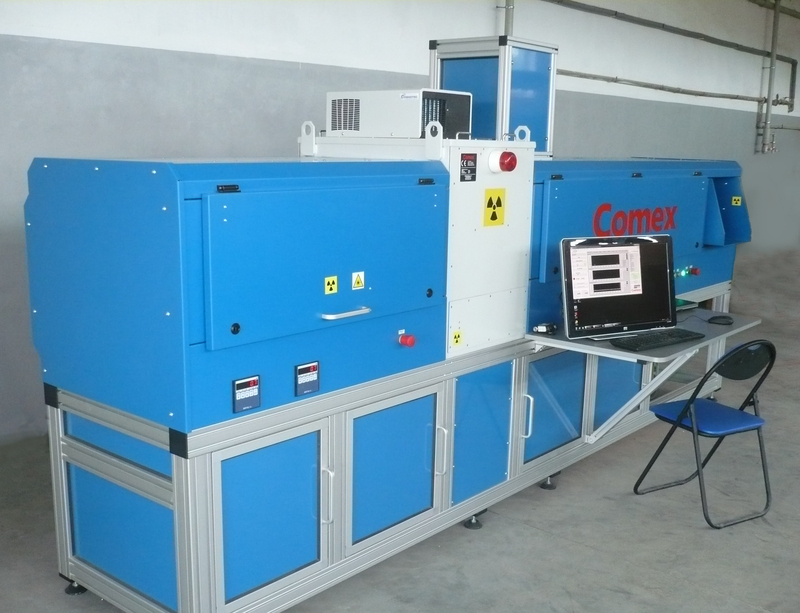 The scanning results can easily be used to find differences between the particles and define measurement methods as well as sensor types to identify the particles of interests. Furthermore, the defined identification methods can be used to separate such particles into two separate fractions. This information can further be used for industrial scale sorting systems. Visible light source and camera analysing the reflectance index of the material surface in the light wave length range of 400-700 nm. Here different individual light bands can be used by applying various filters in addition to the regular RGB frequencies. 3D camera identifying the vertical dimension of the analysed particles. This can provide additional information about the analysed material in combination with the other sensing techniques. At the end of the transport belt a simple rejecting flap is installed to divert the analysed particles to two separate containers, when the system is operating in the sorting mode. The containers are equipped with scales, thus both fractions can be weighted online under sorting mode, or each individual particle can be weighted in the scanning mode. Example of identifying 4 different groups of particles depending on the contamination degree (visible light analysis). Identification of different particles using parameters for texture analysis. Example of X-ray sorting of Zn/Pb ore. Visible light analysis (above) and X-ray image (below). 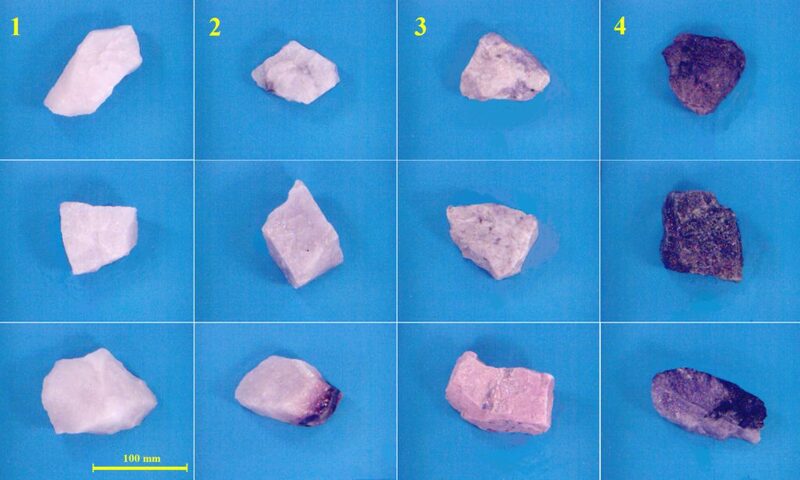 The left group represents high metal content particles, while the right group contains waste fraction. 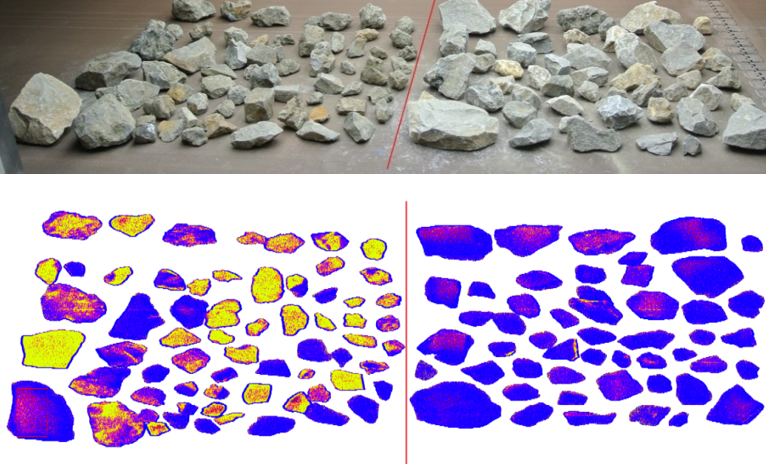 X-ray analysis of the chrome-iron ore. Yellow areas distinguish the high quality ore from the regular rock material (red). 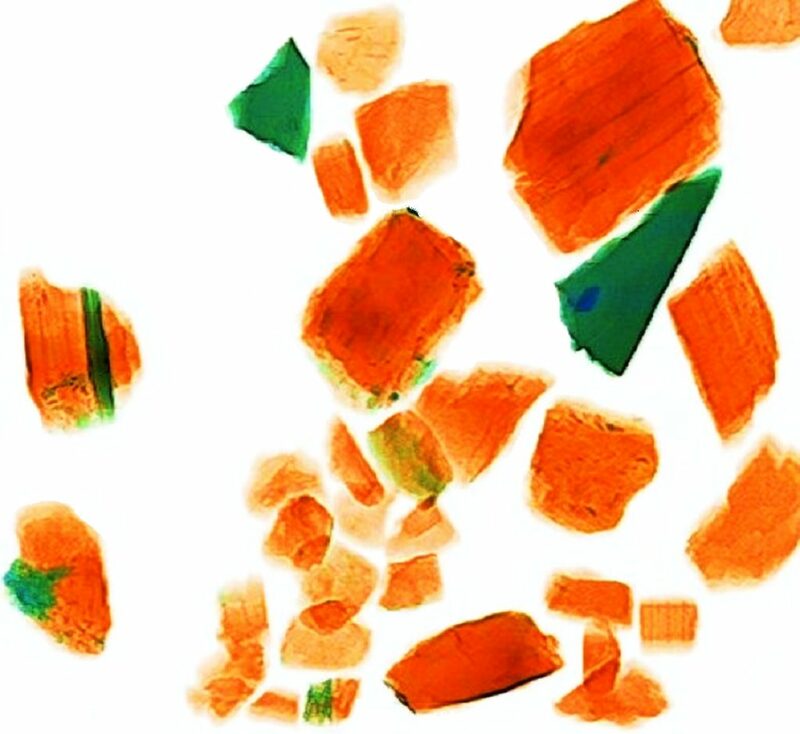 Image scanning example from X-ray scanning of coal (orange). 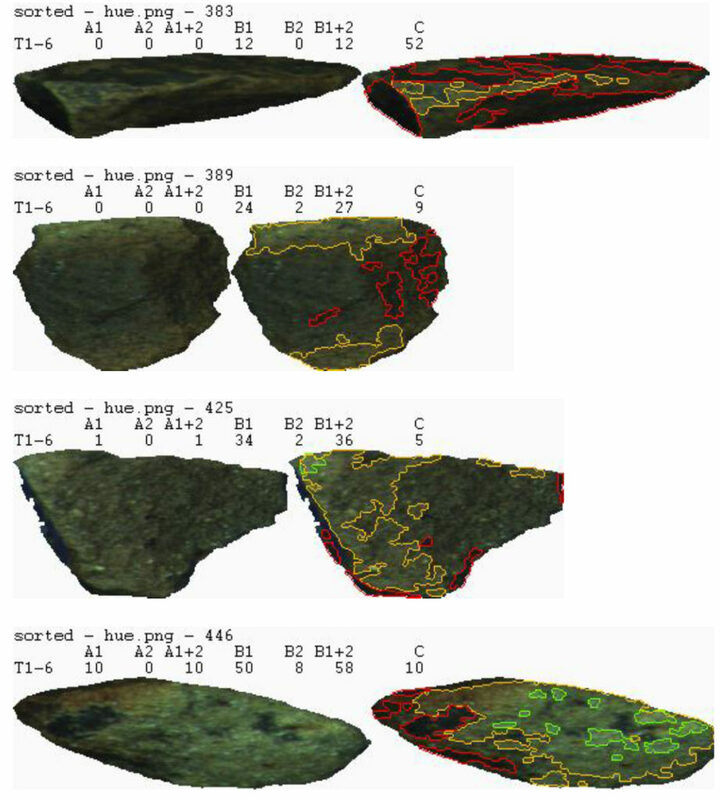 Green areas show exact shape and size of the rock particles. Example of visible light imaging and X-ray scanning of tungsten ore (black). Green areas show waste particles.